Published independent scientific evaluations prove that participants in the Move With Balance program will reduce their medical costs by 20% and reduce falls by 66%. We have invested in four independent evaluations and one Cost/Benefit Analysis. An evidence-based study, conducted by Lorrin Pang MD, Maui District Health Officer for the State of Hawai‘i, was published in the November 2013 issue of the “Hawaii Journal of Medicine and Public Health”. Dr Pang states that “the efficacy of the Move With Balance program to prevent falls is 66%”. I met Karen Peterson twenty-five years ago when she introduced me to her expertise in movement and perception. We worked together to help alleviate vision and balance issues. Her present concern is enhancing balance and thereby preventing falls. This program is based on cutting-edge science. She uses modified techniques that Olympic athletes employ with good success. Performed by Dr. Lorrin Pang, Director of the Maui District Health Office. Move with Balance is now evidence-based! The efficacy of the Move With Balance program to prevent falls is about 66%. Full article is published in the Hawaii Journal of Medicine and Public Health November 2103. Read the in-depth article here. Dr. Lorrin Pang and Kristin Mills from the Maui District Health Office have written a Cost Benefit Analysis of Move With Balance®. Falls among older adults cost a lot of money in medical expenses each year. Move with Balance has previously been shown to be an effective program at reducing falls. We compared the cost of this program to the estimated monetary benefits of reduced falls. The results are the cost benefit of the Move with Balance program. This research is important because it stated that as a result of the Move with Balance program, a substantial monetary benefit was gained in reduced falls as compared to the cost of conducting the fall prevention program. The benefits may be even greater if one includes non-medical benefits (i.e., improved activities of daily living, social support, etc.). These monetary benefits can be increased by providing the Move with Balance program to more older adults on a regular basis. Cost benefit analyses are important for all programs to conduct so that the return on investment of various programs can be directly compared. Most health-related programs conduct analyses to assess the program’s effectiveness (efficacy). But many programs do not conduct cost benefit (or return on investment) analyses. Cost benefit analyses are important for various reasons. First, some programs may be effective at reducing falls but may be very costly to conduct. Hence, the return on investment may be low and unrealistic to financially sustain. Other programs may be just as effective and also more affordable. The more affordable programs would be more sustainable to conduct and have more bang for the buck. Next, when multiple health promotion programs are competing for limited funding sources, the program’s cost benefit results can be used to determine which program has the potential to not only positively improve health, but also create more monetary benefits. Hence, cost benefit analyses are important to conduct so that programs can be chosen that are both effective and financially sustainable. 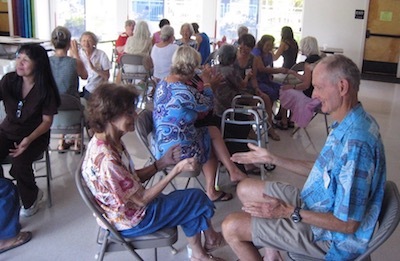 Evaluation of Move With Balance® with Music at Kaunoa Senior Center by Kristin Mills from the Maui District Health Office. You can read more about the program and evaluation here: evaluation #1 and evaluation #2. Evaluation requested by The Injury Prevention and Control Program of the Hawai‘i State Department of Health. Evaluation performed by Dr. Lorrin Pang, Director of the Maui District Health Office. The following is a summary. Performed by Carol S. White, RN, over 40 years’ experience, 25 of these working in community health and long term care; University of Hawai‘i Maui Campus Nursing Faculty since 2002; administrative level nurse in community health; evaluates programs and is responsible for CQI (continuing quality improvement) of patient simulator program. Here is the summary.